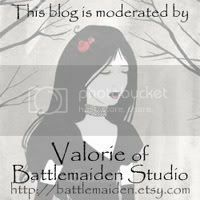 Battlemaiden Studio: Conventions and more decals! I just got finished with Aggiecon back in College Station. Aggiecon was the convention that I was a part of during my years at Texas A&M University, and I love to go back and meet all the new kids and see how my friends are doing. This year I got a dealer's table, and my decals flew out of my hands. So, now I'm working on getting into several more shows in the near future. If you're somewhere in or around Texas, and have an idea for a Sci-Fi, Horror, or Fantasy convention you'd like me to vend at, just let me know! So far, I'm set for sure to do A-Kon. I just got verification this morning, and I'm totally stoked to be going back. I'm planning to attend Delta H Con at the University of Houston, and Comicpalooza, but I'll be sure to post once I get verification for both of those. I've got a lot of new decals available in my shop too! And I'll be adding more as time goes on. There are several commission pieces I need to do still, and I'll have more drawn images available in a few weeks. Suggestions? Let me know!